How cute are the icecream cones on top of the cake and happy birthday to your friend. This is stunning! I was fooled into thinking it actually WAS ice cream for a few minutes, while I drooled over my keyboard! This is completely amazing! I'm drooling at my computer! and I love the scoops in the middle of the cake best, I don't think it looks awkward at all! awesome photography too! p.s i don't know when your blog header changed as I always follow you in google reader normally but I love it! I love mint chocolate chip and this post made me crave it. What a fabulous and flavorful cake. Love it! I let out a little squeal when I saw the mini ice cream cones on the cake - too cute! 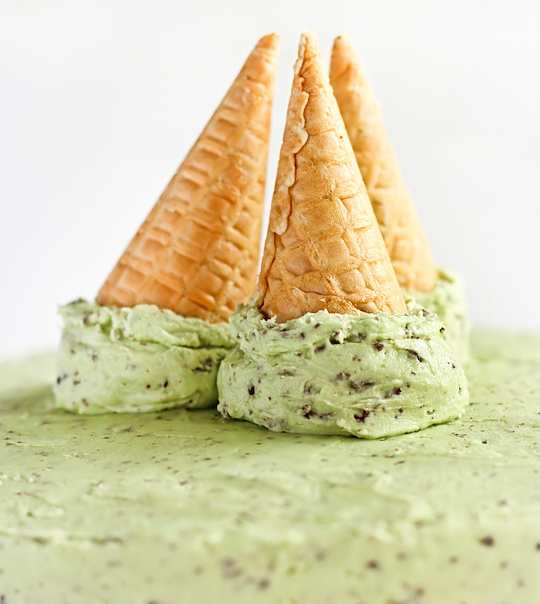 The icing looks exactly like mint choc chip ice cream! For years when I was a kid, mint choc chip was the only flavour I'd ask for when we were out and Mum offered to buy me an ice-cream. I haven't had it for years now but obviously it's a flavour which is close to my heart and always brings back a moment of childhood when I have it. Love the mini cones on top of this cake, but how dark and chocolately is that cake! Wow this cake looks perfect! Great job. This cake looks like it could just love you too. I'm pretty sure it would love me. Tell Regex Man Happy Birthday from probably one of the rare foodie bloggers that not only knows what Regex means but can also read Regex and write them. This cake looks amazing!!!! I love the scoops of "ice cream" on top. So adorable....and I love mint chocolate chip ice cream too. Yum!!!! I want a huge slice of this. ddhsfu today's actually my birthday and now i'm the saddest panda ever that i'm making caramel brownies when this was apparently an option. saving this recipe for the next time i have an excuse to bake a cake. oh my gosh - this looks JUST like Baskin Robbins mint choc chip and that's BEFORE I read that part! I love it - the scoops of ice cream and the upside down cones, so very minty cool! This is fantastic - it really does look like mint choc chip icing! 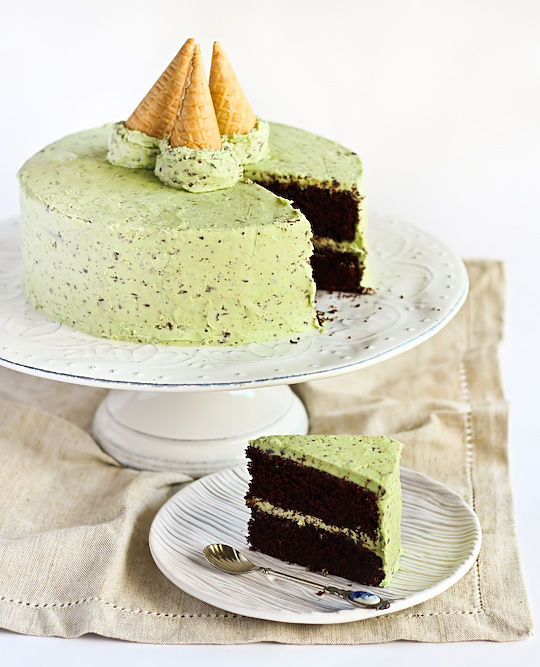 Mint chip is my faaaavorite ice cream, and I've been looking everywhere for a fantastic chocolate cake recipe. This cake is a winner for me all around! That's awesome! Love the cones on top :D Will be making this in the future to be sure! I send you an award, so please visit my blog! This looks FABULOUS!!!! This is my husband's favorite cake and I can't wait to surprise him with it!! I actually don't like chocolate cake either! But I think I could make an exception for this one hehe. And I like the scoops in the middle better. It makes it look more like ice cream! This is AMAZING, and it would be fantastic for my dad, whose birthday is coming up soon. Thanks! Oh whoa, totally looks like an ice cream cake from Baskins Robbins, nice job! Sooo epically tasty! I ate all 3 cones on top and had a massive minty sugary overload! Beautiful images, such a lovely looking cake. Wow! It looks really..... minti! This really looks like you frosted the cake with ice cream! Love it! This is such a beautiful cake! Just Stumbled Upon you and love the site. Totally doing this in cupcake form to surprise my friend who LOVES mint chocolate chip. She'll freak! Just finished reading your gorgeous post over at Poires au Chocolat and thought I'd come have a browse round your site as haven't visited for a while. This post is AWESOME. 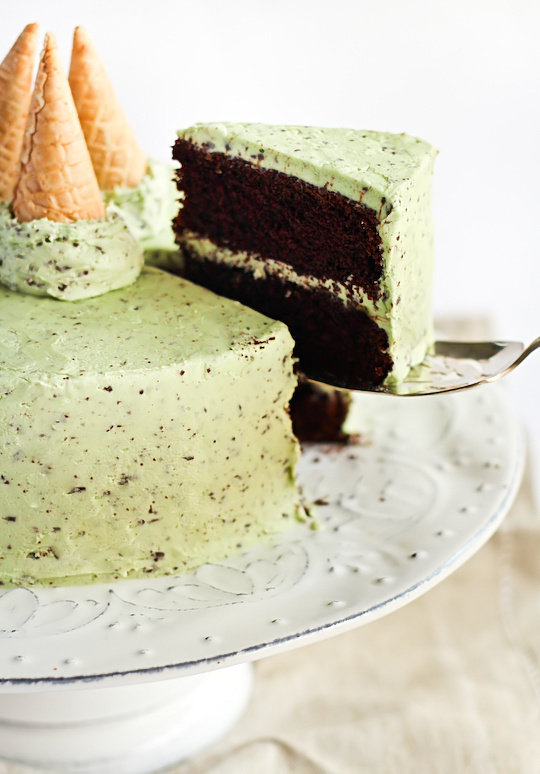 Mint chocolate chip ice cream is my absolute childhood favourite, so to combine it with cake...epic! I love what you've done with the little ice cream cones on top - ridiculously cute. Am definitely bookmarking this to make as soon as I have a birthday or party as an excuse! I definitely like this fantastic combination. Gauri G - Yes it should be fine to leave the second half of the batter sitting while you bake the first half, this is what I did as I only had one tin. Phuoc'n Delicious - :D thanks! they were a pain to chop up into the right size but worth it! Cupcake Crazy Gem - Aww good! Was worried about the scoops. :D So glad you like the header, I'm so in love with it! Sophie AKA thestickyandsweet.com - I didn't even know there was a spearmint choc chip! Janine - Yay that makes me happy, it was tricky getting the colour right! Hope you like it! The Procrastobaker - Aww yay! You are so sweet. Lora - I'm craving the ice cream now too! mademoiselle délicieuse - I haven't had it for years too, this is making me want to go buy some! Nat - Thanks so much! Jennifer (Delicieux) - Thanks!! This is the kind of cake that you have to eat in huge slices, no tiny slices allowed! mybeautifuldisasters - hope you like the recipe!! jas - the gluten free scallywag - yay that's what i was hoping for! thanks! Julia @ Boredom Abounds - :D Thank you! Nic@diningwithastud - Yay thank you! meghan - :D thank you! Hope you like it! Márti - Thanks so much for the award! The Food Mentalist - Thanks! Bonnie Lewis - Aww I hope he likes it! JasmyneTea - I hope you make it and like it! Julia - Awesome, thank you!! Emma - Thanks very much! Gabriel Vasile @ Cool Things - haha...thanks? Elizabeth Branch - Thanks for stopping by! Madi @ Sit Down and Eat Your Peas - Ooh would love to see it in cupcake form! thelittleloaf - Aww thank you! Hope you do make it! Lissa (The Wedding Bistro at Bellenza) - It would be the most epic wedding cake ever if you made it four layers instead of two! OOO My favorite flavors! 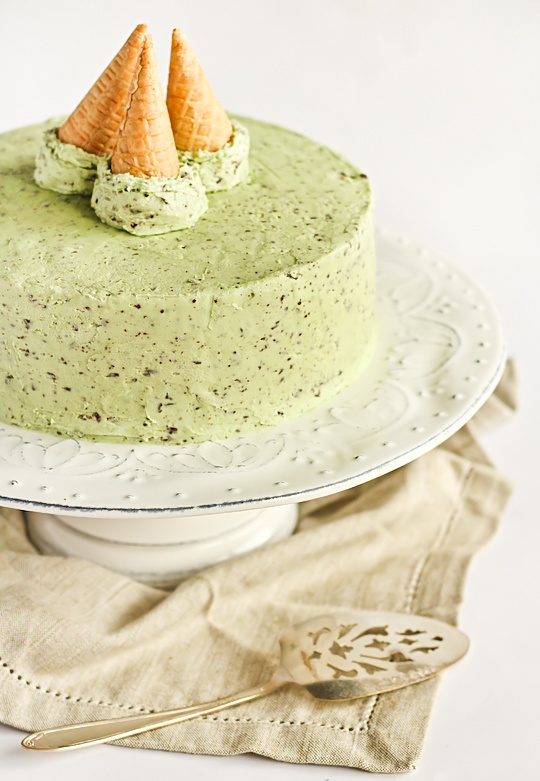 Mint chocolate chip is my favorite ice cream I can only imagine how good it is in a cake! I made this delicious cake for my boyfriend's birthday. He is the ultimate mint chocolate chip fanatic! I ended up using mint extract instead of peppermint because of what was available at our store, worked out fine. Thank you very much for this wonderful recipe, he couldn't have been happier! I love chocolate chip mint ice cream. This looks even better. I made this on Saturday and it was great. I used the quantities given for 1 X 2 layer 16cm cake and 1 X 2 layer 10cm cake and it worked well. I didn't add the ice cream cone decoration, but it was beautiful and delicious all the same. Thank you for the great recipe. Wow I made this for a work event with a milk chocolate and dark chocolate layer and a small sample for my friend and I to try and we almost ate the whole cake in one go! This was so delicious, but even better it was so simple to make! Keep the yummy cakes coming please! This cake looks delicious. I have decided to make it for my sons birthday. ...I wonder if the recipe can be made for cupcakes. I'll have to give it a try. Thank you. Beautiful colour!! What colour n brand did you use? Ohhhhh my goodness! This looks absolutely delicious! And you have a lovely blog! I'm deeply in ♥ with it! I just found this recipe on Stumble Upon and bookmarked it. Looks delicious! I can't wait to make it! The frosting looks amazing and makes it look like an ice cream cake. Just tried the icing recipe!! Pure genius!! I used the Hershey's cake recipe along with this icing. I made it for my mom's birthday because she loves mint with chocolate, especially the mint/chip ice cream. And she loved the cake!! Success!! My goodness. 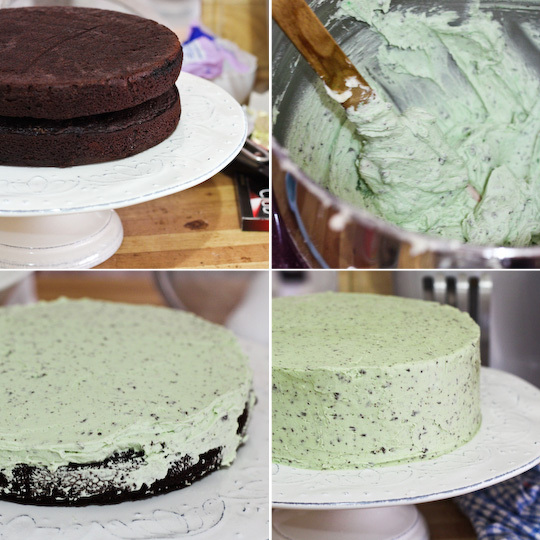 I was looking at this in awe and wrote down the recipe and realized i prob dont know a soul who would eat the mint icing. 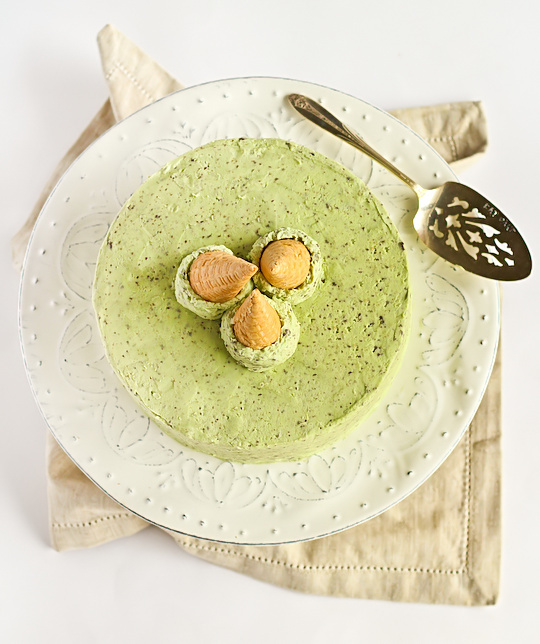 My friends birthday is saturday and i said "whats your favorite desert" and he said "mint"
so you bet your sweet britches im making this tomorrow. Oh wow! I feel exactly the same about chocolate cakes. My family similarly ask for them all the time and I shy away from making them because they are dry in texture or don't really taste like chocolate to me at all. Can't wait to try out your recipe. Love the extra touch of more salt - my best ideas come from my mistakes (hee hee). Just made the icing for my sons birthday!! It came out beautifully!!! And delicious!! This blog makes me drool! I have been reading solidly for 2 days and so inspired by this cake I have it baked and waiting to decorate for my friends birthday! Can you please tell me what brand of peppermint essence you use? I have used the queens brand in the past but I would prefer to use one that had a more natural mint flavour, so it really has that delicious minty choc chip flavour that you would get from a mint/choc chip ice cream! Have your cake! - Yay! I love when people can't resist whipping up a cake after reading my blog :D I use queens brand too, it tasted just like mint choc chip ice cream to me! But if you want something more natural, maybe try blending up some fresh mint leaves with a tiny bit of water and using that instead, but it will be a lot more mild. I am a Bulgarian fan of your blog and read careful every article you've posted!! And since so far I've been only reading, decided to try this cake.. BUT.. I am in Bulgaria we here measure in grams - you will say it's easy to convert cups into grams, but I made a Google search, and believe me I found different measures for it!! Different even in a different country! Even so I tried to make the cake, and I baked the bases, but the taste was a bit bitter, maybe it's from the coffee or cocoa, I don't know, but I didn't like it.. it wasn't chocolate at all.. I don't know what I did wrong.. at the other hand the icing got too dark because of these 150 gr chocolate.. I've should put less.. anyway my request is can you tell me how many grams are your measures. I know you are posting for the most of the products grams too, WHICH I APPRECIATE MUCH!! But gues tbsp, teasp and cups are different.. THANK YOU IN ADVANCE!!!!!!!!!! MUCH LOVE FROM BULGARIA!!! Soul Shaker - I'm sorry you had issues with the cake. We measure in grams here as well, but the cake recipe which I used is from a site that doesn't use all gram measurements. If you found the cake too bitter then it was probably the coffee, just replace it with water. If the icing got too dark then you should gradually add the chocolate pieces until you are happy with it, don't be afraid to adapt! I don't know how much more information I can give you, I use a 250ml volume cup, a 20ml tbsp and 5 ml tsp. I can't give you the exactly gram measurements for this particular recipe because I did not measure everything in grams in this case. What a fun, fun cake! Looks amazing!!! I think I'll make this for my dad's birthday! Where did you get your cake plate? I love it! why don't you use milk in the frosting? Because I didn't want to? Feel free to adapt it if you want, though you'll probably need to add more icing sugar as the milk will make it more runny. Okay, I've been trying out making cakes from scratch this week and everything I've tried has always used milk, that's why I was confused. My Mint Chocolate Chip Cake turned out great though. Thanks for the recipe! Instead of making it mint choc chip, could you replace the chocolate and mint in the icing for chopped oreos? Or would the icing be all out of whack? and I'm always in the mood for baking! I made this tonight for my mother-in-law and it was awesome! Hi I'm just in the process of making this and as I added the processed chocolate to my icing it turned it an unpleasant brownish colour :( I wondered if this happened to anyone and if there were any solutions? It sounds like you processed the chocolate too much. You want it to be small chucks but not a fine powder. It's best to sift out the finer powder before you add it to the icing, and only gradually add the chocolate until you're happy with how it looks. Also it's better to chill the chocolate before you process it to stop it from melting. And make sure you're using a good quality dark chocolate. This is brilliant! My husband's two favorite flavors together. You're going to make me look like a hero on his birthday. Thank you! This is amazing and I can't wait to make it for my husband, who is a mint chocolate fanatic. I have a technique question for you - how do you get the cake so perfectly level? I made a strawberry lemon cake this weekend and even though I trimmed the cake, it ended up a little lopsided (maybe the icing was too soft?). Thanks so much - I just found your blog and I love it! Oh, my GOSH!!!!!!!!!!! I love mint and chocolate!!!! Truly a thing of beauty! thank you so much for posting this recipe. i made a different version of it. I made a butter milk chocolate cake and the covered it with swiss meringe butter cream . it made the cake lighter and the kids said it tasted exactly like the ice cream. once again thank you so much for the recipe it was a total hit. 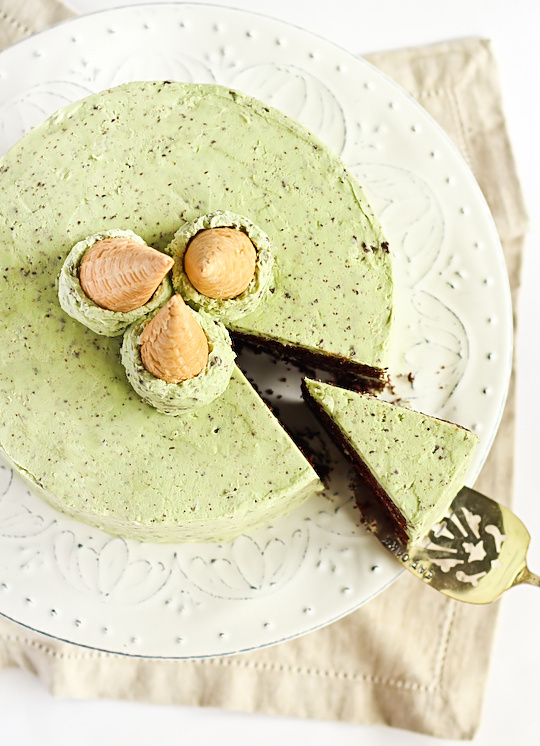 Hi, how would this cake taste differently if I were to use mint essence? How is peppermint different from mint? It will just be a slightly different flavour of mint. Either should work fine. As mentioned in the recipe, I always line the base of my cake tin with good quality baking paper as well as greasing it very well. If you still have trouble with sticking run a thin bladed knife around the edge of the tin before turning it out. Ice cream cones on top are the perfect touch to an already fabulous cake! I've had issues with the baking time of this cake, I tried it with 9inch pands and with 22cm springforms and both times it's taken close to an hour for them to bake. I guess try turning your oven temp up 5-10 degrees? Otherwise if your cakes turned out nice after an hour then it depends on if you're patient enough to wait the extra time! I followed David's original recipe and I think it may have taken slightly longer in my oven because it tends to run cooler. Would removing the coffee upset the balance of the recipe? Would I need to add in something else (milk/water) instead? I dislike coffee in cakes, it just doesn't work for me. Cant wait to give this cake a try! Just have one question - I have a creme de menthe flavour, will this work for the icing? It should! The flavour might not be as concentrated as peppermint essence so you might have to add more which may lead to a runnier icing, in which case you can probably just add more icing sugar. awesome! thank you so much for your help & inspiration! I will definitely attempt to make this! Amazing! Would this icing work with the sponge recipe you use for the tim tam cake? Made it yesterday. Turned out amazing. The only flaw was that....I spent hours perfecting the mint color of the icing, and when i deemed it to be perfect and added in the chocolate, the whole frosting turned brown! I think i might have crushed the chocolate a bit too finely :( I wanted the mint color. Also, you haven't mentioned in the recipe whether the coffee needs to be at room temperature or boiling. I used, not boiling, but hot coffee, and the as soon as i added it to the mix, loads and loads of lumps formed.